Wellington LTD strives to bring you the best crafted, Unique Collectible Firearms on the market. 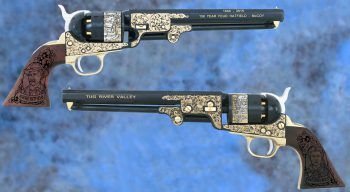 The quality craftsmanship and intricate detail makes every scene depicted in 24 karat gold and jewelry grade nickel come alive on our Limited Firearm Editions. All original art resources are tied to accurate History. We strive to make less collectible firearms than the demand, which has protected our customers investment. Elaborate laser etched engravings are located on the stock and forearm. We hope this collection of images will help you envision the varied firearm designs and customization available for your Family Heirloom. Purchase your Buffalo Soldier 150th Anniversary Limited Edition TODAY! Purchase your Transcontinental Railroad 150th Anniversary Limited Edition TODAY! Wellington LTD encourages your involvement in determining the style used in crafting your Collectible Firearms. We are very versatile and will react to your needs in a timely and highly professional manner. Let us create a unique firearm for your county, city or in honor of your family business. We are your source for custom etching with the highest quality available. Every collectible firearm edition is very limited in availability and is quite unique. Want to know about our newest editions? 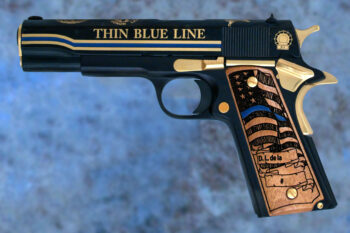 Thin Blue Line Special Edition .45 cal. Wellington LTD encourages your involvement in determing the style used in crafting your collectible firearm. We are very versatile and will react to your needs in a timely and highly professional manner. Let us create a unique antique or custom firearm for your county, city or in honor of your family business. We are your source for custom etching with the highest quality available. Every collectible firearm edition is very limited in availability and is quite unique. We also have French fitted carrying cases and beautiful display cases available. Let your imagination and our skilled artist create the perfect firearm gift.